I have to say: activity books have certainly changed since I was a kid. I can hardly believe how cool they are now, and you know an activity book is particularly tempting when even full-blown adults are snatching up pencils and getting busy with it. Such was my experience with Terry Denton's latest. 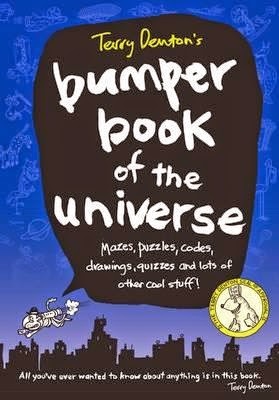 Kids love all things space-related, and this fabulous (yes, it's 'bumper'!) tome takes them on a supersonic journey to the stars, with drawing and imagination prompts, codes, quizzes, mazes, puzzles, seek-and-find and lots of cosmic facts. Featuring the classic illustrations Terry is renowned for, a whopping 304 pages will have the kids busy well into January, so make sure you snaffle a copy for the Christmas stocking.